China, Zhou to Chin Dynasty. Large (early) Ban Liang. ca. 250 to 200 BC. OVER 35 MM. 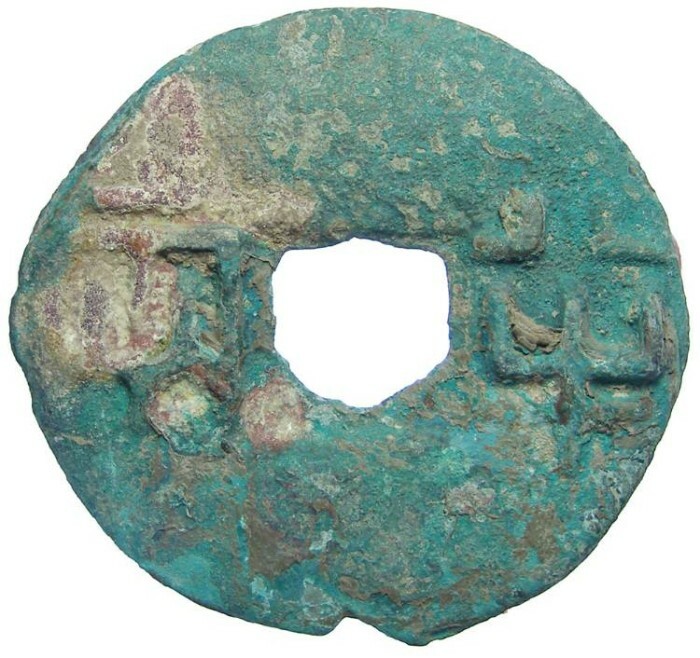 Date : The exact dating of these early large Ban Liang coins is not yet firmly established, but there were certainly issues of them prior to 300 BC. As a general rule, the larger the diameter, the earlier the issue and this coin at over 35 mm is huge for these. Most likely this is a late Zhou Dynasty example, but it might be from the early part of the Chin Dynasty. Reference : Hartill - 7.1 to 7.7 variety. Schjoth -79 to 82 variety. Size : 35.1 x 37.7 mm. Weight : 9.20 gram. This probably averages about 35.5 mm, with the larger 37.7 mm measurement across the sprew removal point where there is a bit of extra metal. Grade : VF with a over all slightly crusty green patina with some lighter tan mineralization over the green in some places. This is one of the largest ones of these I have owned.